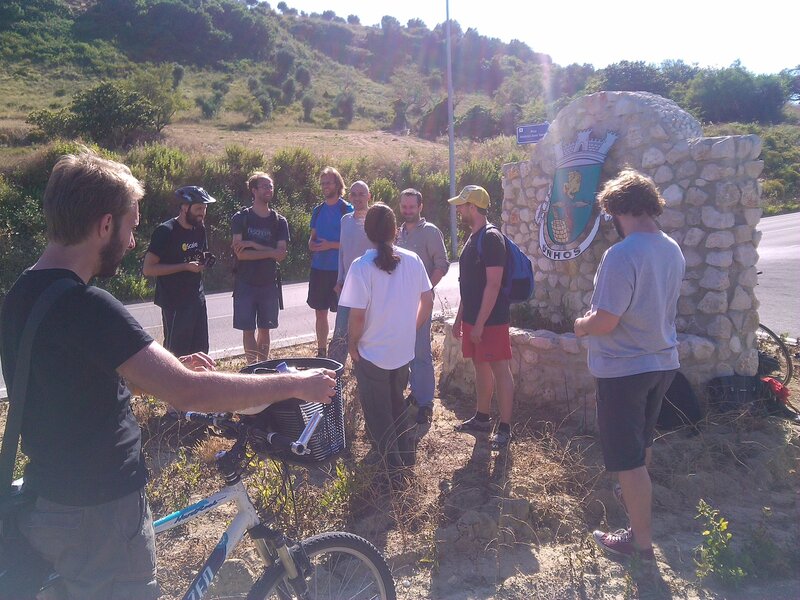 In June, through the Internet Freedom meetup from Lisbon, we organised a day with Michiel from the Unhosted Movement. Francis already did an interview of him some months ago. The idea was to spend a day all together in the marvellous little village of Unhos, next to Lisbon (20km). The meeting point was at 10:30am at the bike shop to enjoy a wonderful trip along the river. By 11:00am we (6 courageous ones) were on our way. After just 10 minutes of riding, we lost 2 mates because of a mechanic issue on Henning’s bike! We lost Michiel also because he was kind enough to help Henning. Igor went there by car to pick them up. After 1:30 hour of bike, we arrived at the village. The guy from the restaurant started to stress us by saying that there were not enough food for more than 10 people… We were planned to be 14, which means 10 showing up… Anyway, after a little visit of the village, and the wonderful church (at least the garden) of Unhos, we were eleven hackers, ready to discuss Unhosted technology all the afternoon! 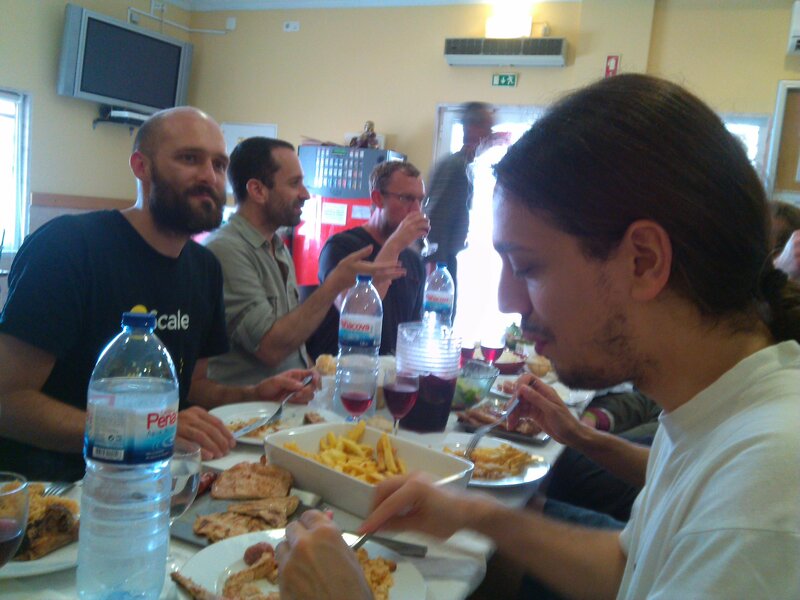 This was actually the biggest part of the day… We started with some Portuguese sausages and a bit of salad. We already started to be full. There was just 3 vegetarian dishes, 3 dishes with fish, and 3 dishes with grilled meat planned. After the sausages, the guy from the restaurant brought 3 big dishes of bacalhau com natas (codfish with cream). Big, like… for 8 people each… After that we were quite full. This was without expecting the grilled meat… We tried to explain to the guy that we planned to work a bit, but he told us that meals were like this in his house… But after the meat, which means after 3 hours of lunch, we were ready (more or less) to start the presentations. The presentation of Michiel was quite animated, a lot of questions and discussions. At the end, Michiel pushed RemoteStorageJS version 0.10 live. It includes a promising feature, experimental support for GDrive and DropBox. It’s really great to see this idea, started some years ago, becoming real! Without any plan, David followed by presenting his twitter assistant which is kind of unhosted (no 3rd party server). 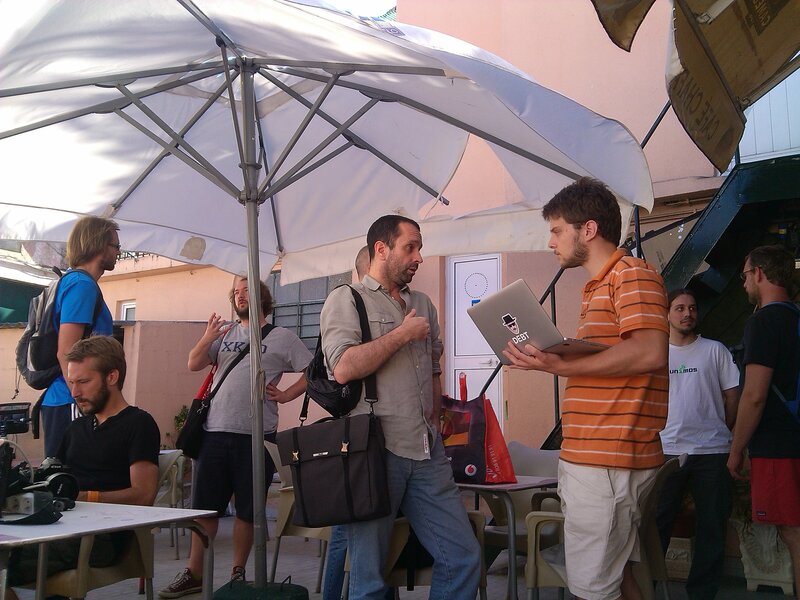 And we finished the day with Luís from Unimos, a decentralised meshed wifi network. As we didn’t have much time to hack on RemoteStorage, it is planned to organise a hackathon the 13th of September in Berlin and Lisbon. And we finished the day with the now classic group picture with the Unhos city symbol!